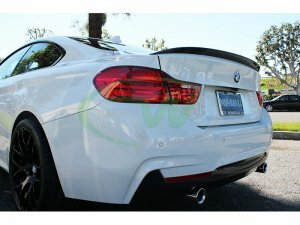 This Carbon Fiber BMW Performance Style Trunk spoiler is just the hot item you need to get your new F32 4 series to stand out. This trunk spoiler is brand new to the market and gives your 428i or 435i that added aggressive touch you so desire. What's unique about the RW Carbon BMW F32 Performance Style Trunk Spoiler is that it's crafted from 100% real carbon fiber - Not fiberglass that is overlayed with carbon fiber. Full CF construction allows for a superb fitting product that's also easier to install because of its' properties. Give your 2014+ F32 428 or 435i only the best with the RW Carbon F32 Trunk Spoiler in carbon fiber.